Yeah. I know I don’t usually do soup in this blog but I’m doing one today. 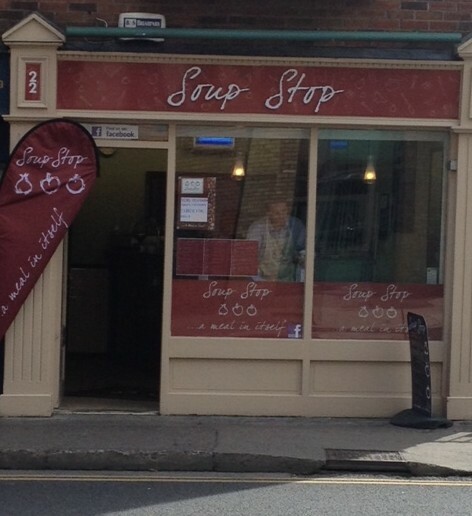 In any case, the Soup Stop (see their website and Facebook page) isn’t just a place that does soup: it’s actually a soup place that, for its size, does an astonishing range of good value soups. Soup Stop is tiny, but it’s mainly a take-away place. It does have a counter and a stool and so fulfils some of my blog criteria. 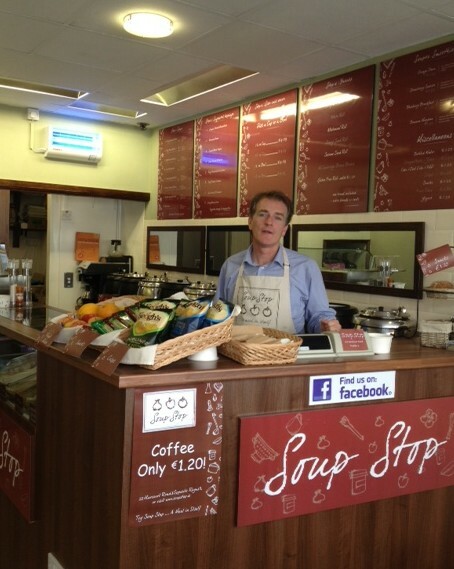 It’s been open for 4 months or so, according to Darragh, Soup Stop’s very welcoming and friendly owner (there he is, in the pic). It’s attractive, clean and bright and a lot of thought has been put into its branding: logo, tagline, signage, menu, bowls, bags, and even Darragh’s apron. Soup is served in biodegradable cups or bowls that come in two sizes: 12oz and 16oz. For a while these cost €3.39 and €3.69 respectively. For that you get the soup, a topping, a roll and butter (or Flora), a plastic spoon and knife and a serviette. You’ll find their regular selection here and if you click on the tabs, you’ll find the toppings, bread choices and other offerings. 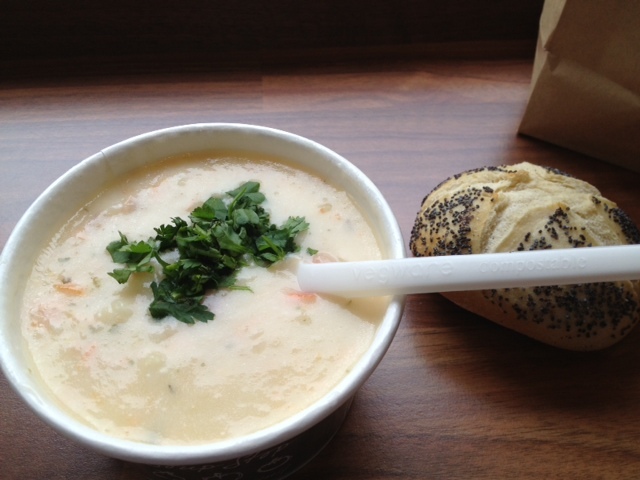 There’s a weekly special soup (this week it was Chorizo) and on Friday, they do a Fish Chowder. I went for the Chowder which is a little more expensive, at €4.99 for a 12oz bowl, but also includes the topping, bread and so on. Darragh also let me taste the beef and vegetable broth which is indeed a tasty creation, with a decent stock base and none of the aftertaste that you get from cheap packet-based soups. I woud guess that the other soups on offer are pretty good quality too. The Chowder was good: thick (and not cornflour thick), with a good but delicate fish taste, discernible vegetables and small lumps of fish. I liked it. The roll was fresh and the butter was soft (there are few things more annoying than trying to spread a rock hard pat of butter with a plastic knife: *first world problems*). 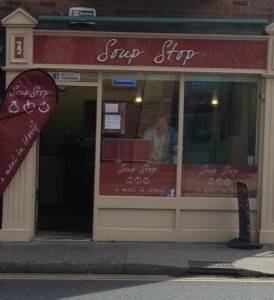 Soup Stop is in a slightly awkward place. You can’t park anywhere near it so it’s dependent on local offices for custom. There are plenty of those but there’s also a lot of local food competition. I’d like to see it do well. Darragh is likely to augment his menu with the addition of a range of sandwiches. If you happen to work or live in that area of town, give it a go. Darragh will give you a hearty welcome and you’re sure to find a soup to suit your mood. By the way, if you happen to be a soup fetishist, have a look at the spouse’s soup blog: Minnie’s Soup Kitchen. It’s an enviable record of dedicated soup making (and bee-related ephemera).